What does the title "The Lights in the Tunnel" mean? 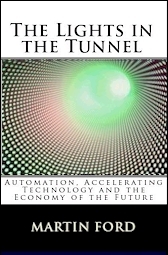 The book uses a unique approach: it creates a mental simulation (or imaginary video game) based on "lights in a tunnel" in order to help the reader visualize the future economic impact of accelerating technology. Martin is an experienced keynote speaker on robots, advancing technology and the future economy and job market. Where will advancing technology, job automation, outsourcing and globalization lead? Is it possible that accelerating computer technology was a primary cause of the current global economic crisis—and that even more disruptive impacts lie ahead? "Provocative" "its logic will haunt you"
Read the author's blog on Future Economics and Techology at mfordfuture.com. This new book takes an in depth look at current trends in technology and globalization and examines what the likely economic impact will be in the coming years and decades. Which jobs and industries are likely to be most vulnerable to automation and offshoring? The primary economic trend in the coming decades will be globalization. True or false? Do we need to adapt our market-based economic system to advancing technology or will the same rules continue to work indefinitely?